Marshall amplifiers are a rock and roll staple. Jim Marshall started his amplification business in 1962 based on what guitarists of the day wanted in an amp but couldn’t find. Marshall certainly wasn't the first manufacturer (Vox had been making guitar amplifiers since 1958), but apparently these guitarists weren’t getting what they needed for their sound. I could drone on about the history of Marshall, but you can find out everything you need to know at their website. It’s a good read, with a nice timeline. Marshall amps have had a major effect on rock sounds, and many guitarists (both professional and amateur) swear by this equipment. From Pete Townshend of The Who and Jimi Hendrix, Judas Priest and Metallica, to Slash and Sum 41, Marshall amplification is the choice for all forms of rock music. Marshall makes a full line of tube amps as well as solid state amplifiers. Whatever your budget or your style of playing, you can find an amp to fit the bill. 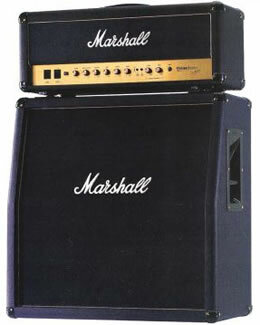 Probably one of the most visible icons in rock music, the Marshall logo is almost as famous as Coca Cola! There's nothing quite as impressive as a wall of Marshall stacks lined up on stage. Get your fix over here at the Marshall Amplifiers website. You’ll even get some good old online guitar lessons for your trouble.